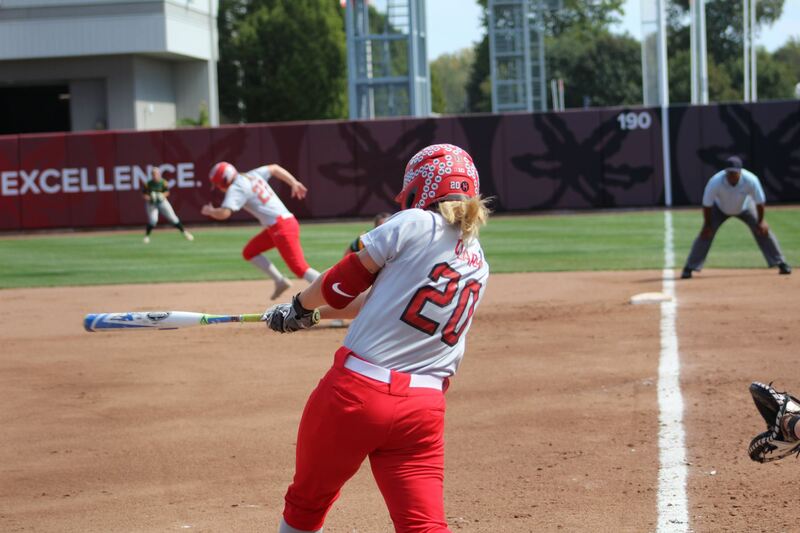 Emily Clark follows through on her swing, hitting a double against Wright State on Sep.
With a home slate and taking on an old rival, the Ohio State softball team will kick off Big Ten play this weekend against Indiana. The Buckeyes (15-9) will take on the No. 22 Hoosiers (25-6), a team which Ohio State has played every year since 2010. “It’s the most exciting part of the year for us because it’s the team that we know well and compete against every year,” Ohio State head coach Kelly Kovach Schoenly said. The Hoosiers won all three games against the Buckeyes this past season, and Schoenly said they are looking to use home field to gain an advantage after playing the entirety of the start of the season away from Columbus. “Since our 24 games were on the road, it’s nice to be home and to compete at home in front of our loyal fans,” Schoenly said. Getting in the conference season, Schoenly said Indiana will be a difficult team to play, playing in a conference she said is very competitive. The matchup between the Buckeyes and Hoosiers might come down to who can execute better and find the time to strike. Schoenly said they will try to keep the Hoosiers off the bases. For the 12-game, 10-day stretch Ohio State had in California during spring break, the Buckeyes recorded 7 wins and 5 losses. Ohio State gained experience from the trip to get ready for the conference season, Schoenly said. This home series series between Ohio State and No. 22 Indiana will start at 6 p.m. Friday. The second game will be at 2 p.m. Saturday, and the final game will start at 1 p.m. Sunday.